Acid wear. It's not some kind of new high fashion styling. It's another name for acid erosion and it is happening to our teeth. As someone who used to drink a lot of fizzy drinks, I'm more than aware of the impact that acid erosion can have on an adult's teeth but until recently I hadn't really stopped to think about the effect on Lara and Holly's teeth. Children's tooth enamel can be upto 50% thinner than adults and our regular eating habits can have a big impact on our oral health. A survey commissioned by Pronamel for Children found that 30% of parents give their children fruit as a snack and 27% give them biscuits. This in itself isn't necessarily a problem because even food and drink with high acid levels (such as fruit which contain fruit acids and natural sugars) can be healthy and safe provided that you don't snack on them for large parts of the day. 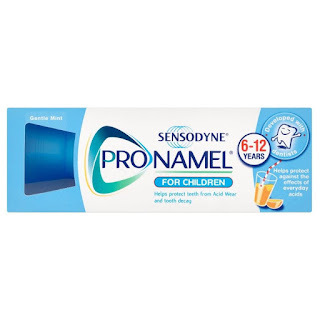 The advice from Pronamel for Children is to ensure that you really limit the number and length of acid exposures that your children's teeth face throughout the day. Pronamel for Children, like it's grown-up counterpart, is a toothpaste designed for 6-12 year olds that is specially formulated to help re-harden acid-softened enamel. It can be used by younger children in smaller amounts. Lara has found the flavour and texture of the toothpaste a bit of a shock compared to her existing brand but I seem to remember the same experience myself when I first tried Pronamel, from Sensodyne! This is a gentle toothpaste designed not to be too abrasive on kids' teeth and it does offer a feeling of re-assurance that you can do something to help your child to combat the effects of acid erosion so that they don't enter adulthood with a problem.